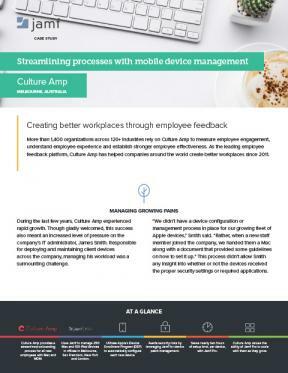 Culture Amp, an organization that helps more than 1,400 companies measure employee engagement, has seen tremendous growth over the last few years. While incredibly exciting, such an expansion left their IT team looking for better and more efficient ways to deploy and manage the increased number of Apple devices their employees needed. Certainly not a sustainable model for an organization looking to scale.